Home » What is it about family? What is it about family? They drive you crazy and yet you can’t get rid of them. The Abraham to Joseph story cycle (Genesis 12 through 50), makes you wonder if God made a point of choosing the most dysfunctional family in the Middle East. Perhaps we are meant to be assured that having insanity practically gallop (see Arsenic and Old Lace) through your intimate relationships will not disqualify you from being God’s people. What is it about family? One thing to start with: the theme of a family’s particular difficulties tends to be repeated from generation to generation. The only way to break the cycle is to do what Joseph did at the end of Genesis; confront, bring out into the open, and then forgive. 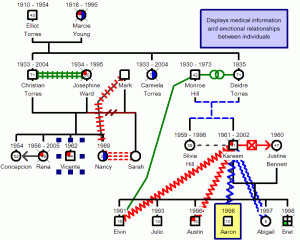 Family systems work often begins with drawing a genogram (see John Bradshaw, Family Secrets) so that the broken relationships of the family can be shown repeating from generation to generation. We don’t know about the family systems that Abraham and Sarah came from. Even after accepting God’s plan for their lives, they acted in a sinful way, breaking the brotherly relationship that Ismael and Isaac were meant to have. Some see the story of Sarah’s hatred of Ishmael as foreshadowing the animosity that underlays today’s Moslem-Jewish conflict in the Middle East. To me, the more interesting thing to speculate on is how the banishment of Ishmael became a family secret that permeates the rest of the Old Testament. Isaac becomes father of Jacob and Esau, twins who are born fighting. Instead of working with these two wayward boys, so that they understand that they are both loved and encouraged to be different from each other, Rebecca and Isaac take sides and polarize the family home. The animosity builds until Jacob is banished from the promised land. The lectionary skips over the complex and powerful soap opera of Jacob’s blended family. A second thing that we might want to say, is that relational skills are teachable. We need to talk about how raising children from different parents in the same home, or having children raised in multiple homes due to divorce, requires an additional skill set. The church should stand ready to help the modern family find its way with integrity, mutual respect, and sacrificial love. In today’s passage (Genesis 37:1-4, 12-28), the older brothers are out grazing the sheep past Dothan because it is a long ways from home. They have decided that the best way to deal with their dysfunctional family is to stay far, far, away. Like many in your church, escape (or self-banishment) is the least emotionally traumatic course. Family system problems get repeated until someone has the courage to confront, bring out into the open, and then forgive. In this story, Joseph gets banished to Egypt where he faces a choice: he can die in self-pity and anger over how rotten his family has been to him, or he can embrace the dream of reconciliation.